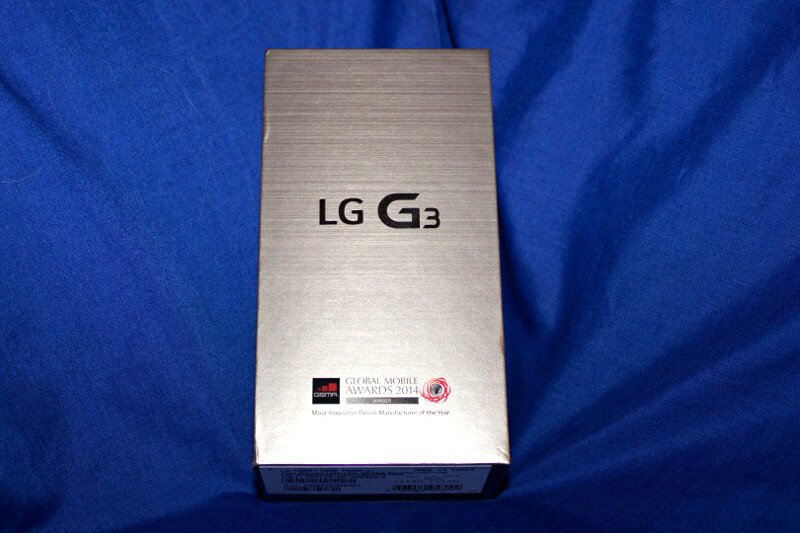 The LG G3 comes in an attractive golden topped box with an unusual wedge design. Although minimal in design it does highlight the awards won on the front and the key features on the back. 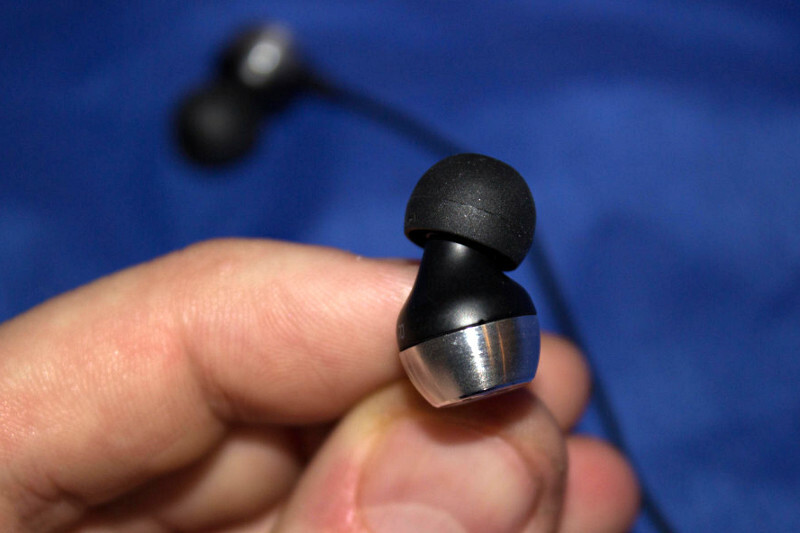 Inside the box you will find the usual quick start guide, wall plug and USB cable along with some solid feeling LG Quadbeat 2 headphones with inline music controls and mic. The Quadbeat 2 headset seems to be much better than the usual basic headset many handsets come bundled with and this is a very nice addition. This is where the LG aims to set itself apart from the Android competition with its sleek and stylish design which is lightweight and feels much more premium than the plastic competition and is a good alternative to the more scratch prone and weighty aluminium alternatives. The first thing you will notice as soon as you get your hands on the G3 is the massive screen but minimal footprint given the very thin side bezels. The bezels on this device are thinner than any other I have ever handled and this is achieved mainly due to the lack of traditional side volume and power buttons. The buttons are (like the G2 last year) on the back of the device which at first feels very strange but within minutes starts to feel natural. In fact, swapping between the G3 and the Galaxy S5, I found myself trying to use the S5 heart rate sensor as a button. The rear volume buttons are located right where the index finger sits while on a phone call and just make sense. The G3 design philosophy conveys a clean look with simply stylish lines and the beautiful “floating arc” back. The curve on the back not only makes it feel great in the hand but also makes the handset feel so thin. The G3 screen is large for a mainstream handset but the body of the phone ensure that the G3 sits easily in the hand and is very pocketable. As I mentioned previously, the massive 5.5 inch Quad HD screen takes up much of the front of the G3 and is simply stunning. Everyone that sees the included ultra HD videos on the device are amazed at the clarity of the screen. Many reviews mention that the back light on the screen isn’t as bright as some other devices and the colours are not as vibrant as the Amoled Samsung offerings and whilst this may be true when compared side by side, the device is beautiful and is easily visible in sunlight. At the moment, much if not all of the content you will view on the G3 will be in 1080p resolution which is much lower than the 2K screen on the phone but it does mean that you have no worries for the future and it does make even 1080p content look great. The 13MP sensor on the G3 may not be quite as high spec as the 16MP on the Galaxy S5 but it does include optical image stabilisation (OIS) which means you get less camera shake which is welcome in low light and when using the 4k video recording features. 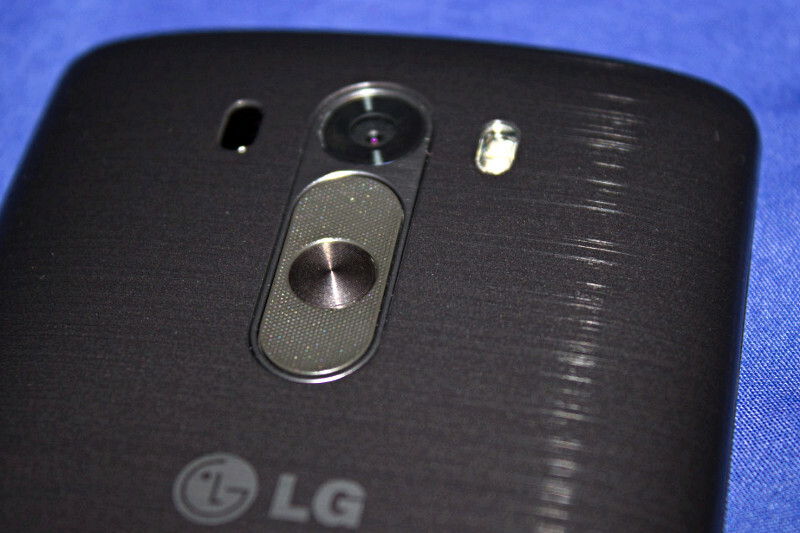 The G3 is also the first smartphone with a Laser auto focus system which gives accurate and very fast focussing. To get laser auto focus on an SLR camera you need to look to the high end so to get this on a consumer smartphone is a big leap forward and a welcome innovation. In day to day tests I found the photos to be of equal quality to the 16MP Galaxy S5 but the G3 found focus faster and more consistently on most tests. The G3 camera also features a dual flash which has 2 different colour tones to give more accurate colour representation and better skin tones. The front facing camera is great if you’re a selfie lover and features gesture controls to help catch the shot without the need to touch the onscreen buttons which helps reduce camera shake and blurry images. 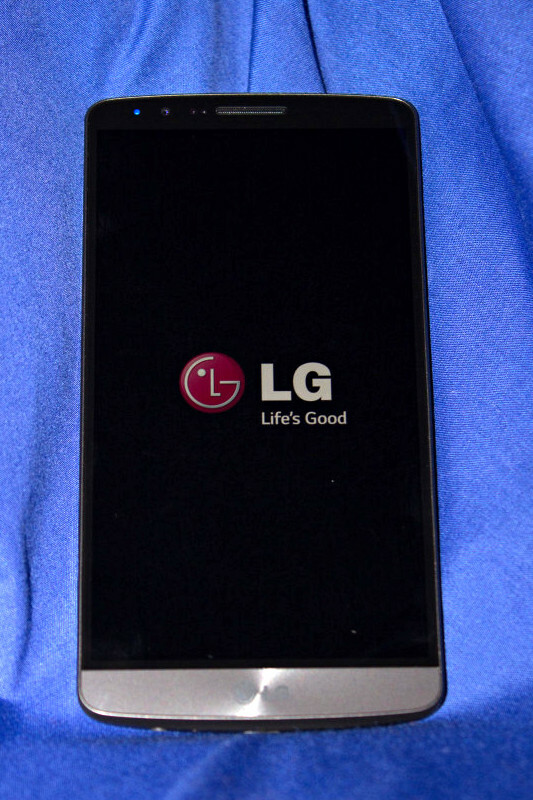 Although the G3 uses the popular Android operating system, it does feature LG’s custom skin which is attractive and includes the modern “flat” styling. The look of the user interface is modern, mature and professional and will become familiar very quickly to any Android user. 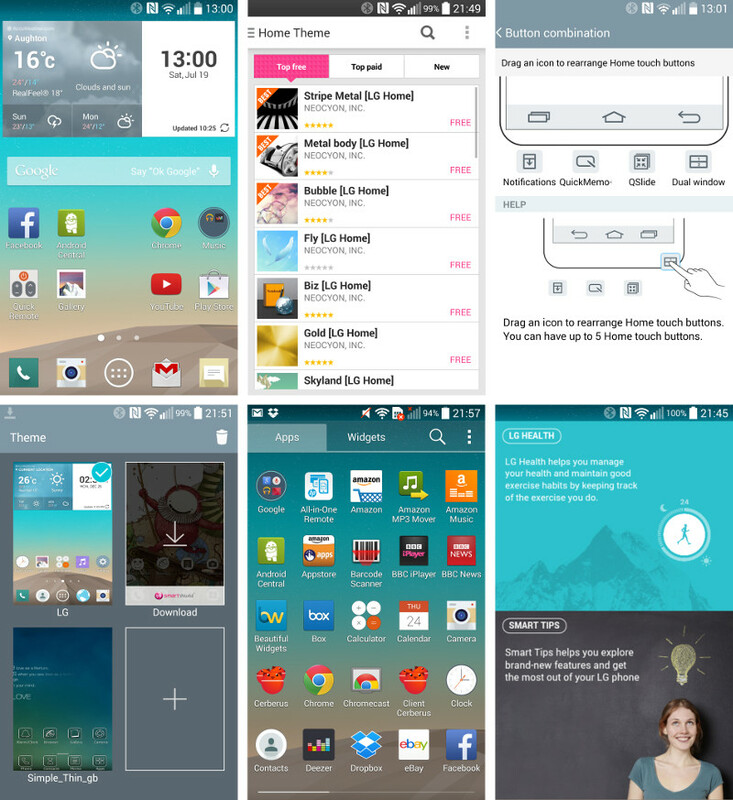 LG have added a lot of customisable options to their take on Android including various annimations and also themes. The themes I tried were nice but many were incomplete and left standard icons with the themed ones which looks a bit odd. LG also allow you to customise the on screen soft keys which is so simple that it should be on every Android phone out there! The included LG smart keyboard is one of the best and most versatile bundled keyboards and allows a lot of customisation and resizing options. That said, I did still opt to install swiftkey after a few days of use. The G3 comes with Qi (pronounced chee) wireless charging out of the box which is a very welcome feature. Qi charging is becoming a sought after feature in high end smartphones and is a great time saver. I did have issues using the G3 with my (cheap) Qi plates when the handset battery was under 90%. It seems no matter what power source the plate is plugged into, the handset is unable to charge and reports “centre phone in the hot zone”. Not only was this very frustrating due to the need to plug the phone in at these times but it seemed to do this sometimes during the night which lit up the bedroom with the on screen alert. Although these issues may be an incompatibility with the cheap Qi plates I have, the same plates do not have issues with the LG made Nexus 5, or the Samsung Galaxy S5 (with S charger cover or third party receiver). Given Qi is a standard I would expect them to work with all handsets. This is an LG innovation and is genius! The power button being on the back of the handset posed a potential issue when turning on the device when on a desk but the knock on feature means that a simple double tap on the screen gives easy access. Not wanting to stop at that, LG have taken this to the next level with knock code. This means you can have between 3 and 8 screen taps as an access code for security. The screen is divided into 4 quarters to allow you to set your code and unlock your phone even when the screen is off. Having only used the phone for a few weeks I cannot fully evaluate the battery life but I can say that it matched or bettered my Galaxy S5 most days and easily lasted a day of moderate use. The number of bars is only a representation of the strength of signal but the G3 seems to hold a stronger signal in many areas including areas of low signal. I was very impressed with the G3 in this area. The only issues I found with the G3, that I was not able to resolve, was compatibility with the Google Chromecast. The Chromecast is so useful and I find myself using it on a daily basis. The G3 has MAJOR issues “casting” YouTube videos and other Chromecast apps. Straight out of the box, YouTube works fine with the Chromecast but Play Music etc do not. If you then update your apps to the latest version, YouTube starts to cause the G3 to crash and makes it impossible to use until the handset is rebooted. Being a Chromecast user, this is a big issue to me and would mean I couldn’t use the G3 as my sole device day to day until this is fixed. The issues do seem to be compatibility between the Chromecast apps and the modified way the G3 has volume controls on the notification tray. The only other issue found was when using the knock on feature to turn on the screen. If you don’t have any empty space on your home screen, you will find that the double tap will launch an app rather than turn off the screen. The only way around this that I could find was to leave the centre column empty. If you’re after a beautiful beast of a phone that will impress you and your friends then the G3 is right up there with the best. With a raft of accessories available and high specs it is a definite contender for phone of the year. That said, it is not perfect and LG NEED to resolve the Chromecast issues as soon as possible as the HDMI dongle becomes more and more popular with the recent updates.